And the reason I reminisce, because.. The grind has got me like a noose. The real world has taken priority position over fishing as of late, but it's all good. Mother Nature has been feeding us a steady diet of record-low temps and ridiculous wind storms, so I haven't missed much. I expect the fishing will ramp up into overdrive in about three weeks, however. 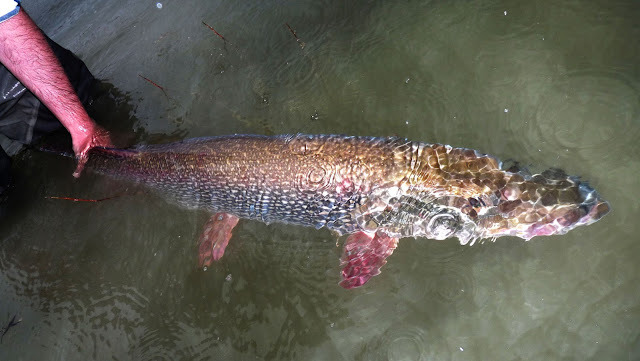 The past couple of weeks have afforded some tiger muskie recon (they're still not quite on the feed) and a "long lunch" outing on a local river. I searched for carp on the flats today, but back-to-back cold fronts have pushed them down into the deep. Instead, I threw crawdad and bugger patterns across rockpiles to target smallies. It was good to get out, if only for a little while. An hour or two on the river is always good for the head. Just before my lunch outing came to a close, I watched a large bronze blaze inhale my crawdad pattern and I prepared to battle a massive bass. My huge smallie, however, soon revealed itself to be a large post-spawn male rainbow trout. This is ironic, as I specifically chose to fish a big river today to avoid disturbing 'bows in the spawning tribs. This guy was chillin' on a rockpile with a few smallies in about 10 feet of water. He was healthy and wicked strong. Normally, I'd feel great about landing a beautiful two-foot 'bow, but not today. Given the timing, it just didn't feel right. 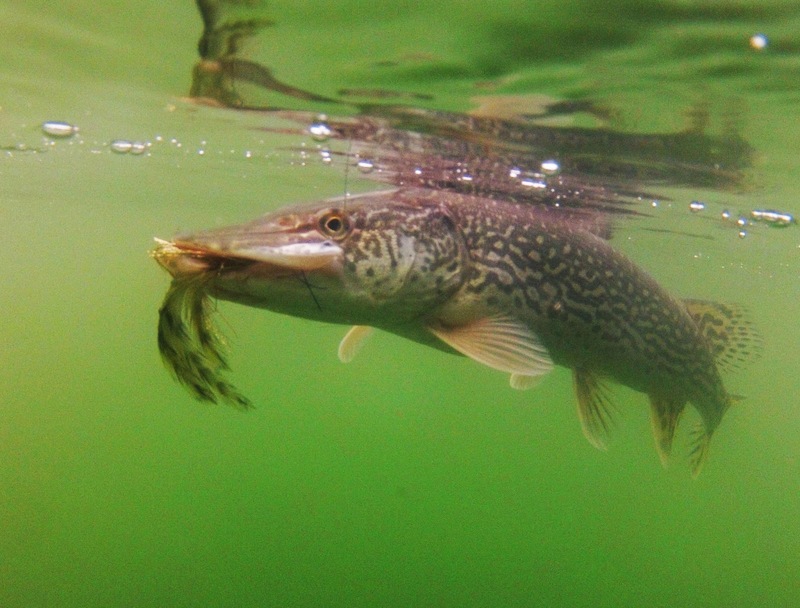 The Northern Pike is the piscine equivalent of heavy metal music - aggression incarnate. If Esox Lucius were to go on tour, Entombed, The Haunted and Trap Them would be the opening acts. The nation of Sweden is known internationally for two things: 1) large pike and 2) death metal. Coincidence? I think not. Ask any Loop-laden flugfisker this side of Göteborg what's on his iPod. It ain't Mumford & Sons. The Swedes love their metal like they love their pike - dark, fast and ferocious. Reign in blood, my toothy friend. It was an act of naked aggression - a pike pushing water through seven feet of brush at high speed to assassinate my fly. I've been fishing over three decades and I've got lots of great memories, but this image will be forever etched in my mind. 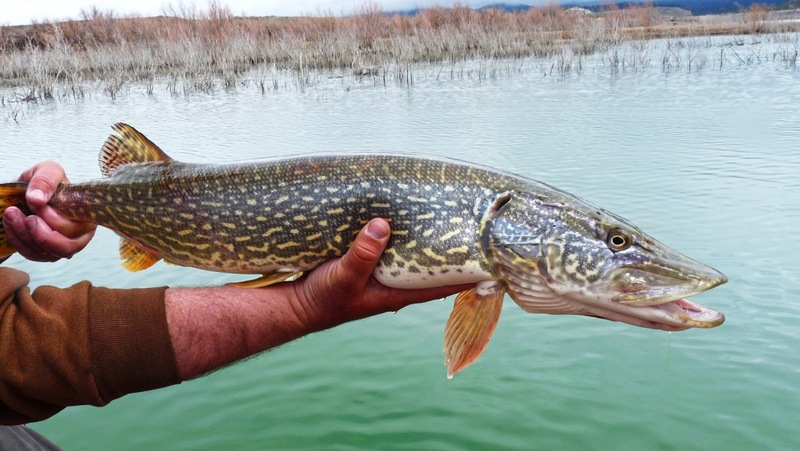 I have a new addiction and her name is Esox Lucius. Visual eats, aggressive takes, explosive fights. What's not to love? Since we don't have pike or muskie within 100 miles of Idaho Falls, Shane and I organized a road trip down south to fish with Targhee. Targhee is the gent behind the Utah Stillwaters blog and he has the area pretty dialed when it comes to toothy critters. He was kind enough to show us his local haunts and he really knows his stuff. 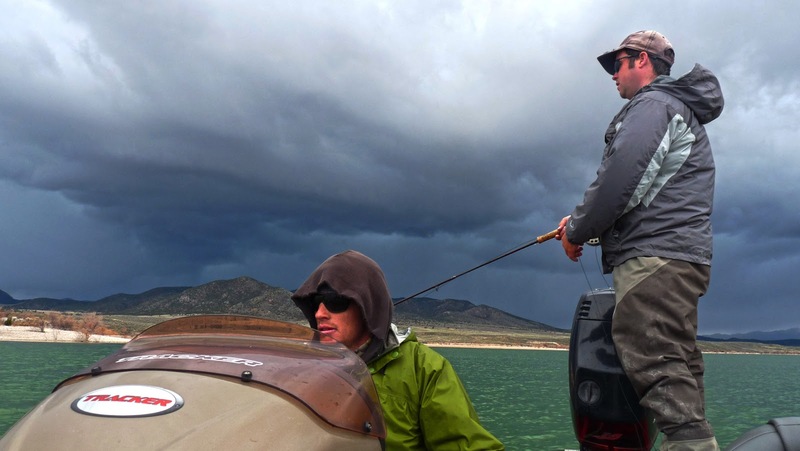 Mother Nature was as volatile as the pike when we first arrived. Although the cloud cover was a welcome ally, the heavy winds, rain and lighting were not. The protocol included throwing large "half a chicken" sized flies and smaller perch imitations up into the weeds where the pre-spawn pike search for forage. Our timing overall was good and the pike were willing players - with over two dozen fish brought to hand. The flies of choice were an olive and gold variation of Nick Granato's "Chupacabra" pattern and a small Supreme Hair perch imitation I tied months ago for large trout. I'd never tied any pike flies prior to planning for this trip and it was great to see the online research pay dividends on the water. The trip highlight came when Shane chucked one of the perch flies against the weed line and let it sink deep. I heard a commotion and looked over to see a large bend in his rod. Out of the corner of my eye, I spotted what appeared to be a monster swimming hastily past the stern. It was indeed a monster. Just a hair shy of the all-tackle state record, to be precise. She taped out at 41.5" with an 18" girth at 20.6 pounds. She was an exceptional fish and a beauty to boot. Congrats to Shane for landing (and releasing) her and to Targhee for guiding us to her lair. You can get the full scoop on this beast and lots more photos at Shane's Fish Hunter Chronicles blog. Can't wait for another round.